Freedom Pro Bluetooth Keyboard Review. Well I got the new Freedom Pro bluetooth keyboard for my iPad and.... Wow! So far so good. The right shift key is weird place and i tend to hit the up arrow key often. The space bar is a little small and right hand thumb tends to the hit the key right to the space bar. Sweet paired to my iPad and now my iPhone. This is going to work great. After a couple of days of using the Freedom Pro Keyboard, it's nice, it does need some work. Like, improved keyboard layout. I have small fingers and even still my hand feels huge and bulky on the keyboard, imagine for the person with big hands. 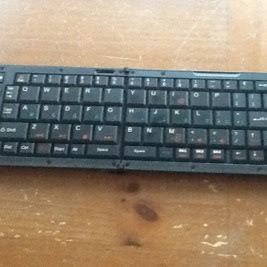 The keyboard that i bought guess has all the bells and whistles and most of buttons don't work with my iPad. My point of view; Apple needs to make a folding keyboard for its line of iPads and iPhones. Quality Apple products. Overall this keyboard will work for now until something better comes along. The World Famous Tommy2Toes (soon to be world famous). I'm just a person sharing thoughts, ideas, photos, etc. If it's meant to be then it's up to me. © 2017 tommy2toes.com. Simple theme. Theme images by follow777. Powered by Blogger.